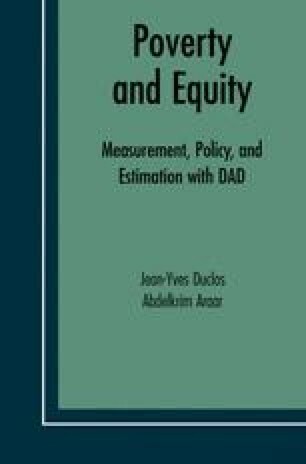 DAD — which stands for “Distributive analysis/Analyse distributive” — is designed to facilitate the analysis and the comparison of social welfare, inequality, poverty and equity using micro (or disaggregated) data. It is freely distributed and its use does not require purchasing any commercial software. DAD’s features include the estimation of a large number of indices and curves that are useful for distributive comparisons. It also provides various statistical tools to enable statistical inference. Many of DAD’s features are useful for estimating the impact of programs (and reforms to these programs) on poverty and equity.